Having been driven to distraction by my current residence situation, I chose on this day to endeavour to make a fresh Plein aire painting. Surely this would wash from me the distasteful business of management and leave me fresh to face challenges anew. 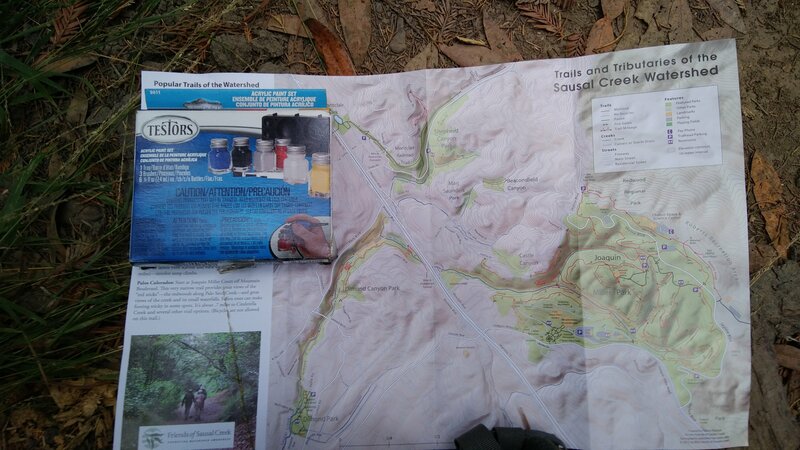 Having chosen a destination close to my new home, I set out for Joaquin Miller Park. Not a minute had I been on the road when I was struck by a sudden thought: I had left my white paint at home! Truly a blunder. White is my main means to control value, and on this day the skies were overcast. I needed white. Desperate rummaging through my trunk yielded questionable bounties: a set of Testors model paint, complete with white—surely this would have to do. Yeah, the stuff you use for model planes. Will I be able to combine oils and model acrylic to make a good painting? I honestly don’t know, I haven’t painted it yet. 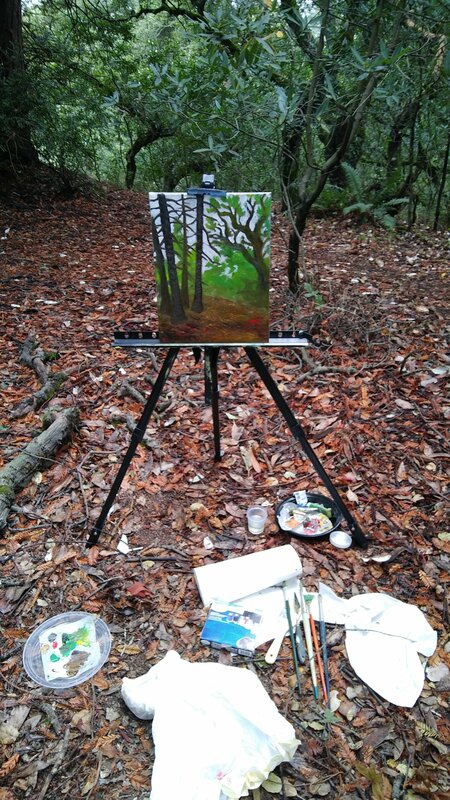 I hit the trail in search of my painting. I can claim no foreknowledge of the man Joaquin Miller, but the last hour of hiking has convinced me he was a connoisseur of forests. The redwoods, oaks and bay laurels combine to make a very pleasant walk. I had walked circles around this park but not seen my painting. Finally I found myself on the same trail I had already traversed. Resolving myself to delay no further, I took the first small side trail. Climbing a steep hill, I turned around and saw my painting. “Good enough”, I said, reasoning to myself that many great paintings started in such a way. Painting time had arrived. Finally found my painting. Turns out it was in front of my easel all along. Working with the acrylics was an interesting limitation. The types will not mix, so all the foreground is oils with no white added. I went back later and put the acrylic white spots in. It made the foreground really rich and dark, and kept the sky separate. By reason of these things, then, my Plein Aire was welcome; once-looming obstacles shrank, and, with each stroke of white, the acrylic sky tempering the value of both surrounding redwoods and my soul, I grew beyond my prior limitations, and my imagination cast light about the overcast forest—illuminated, like a star burning in a constellation. 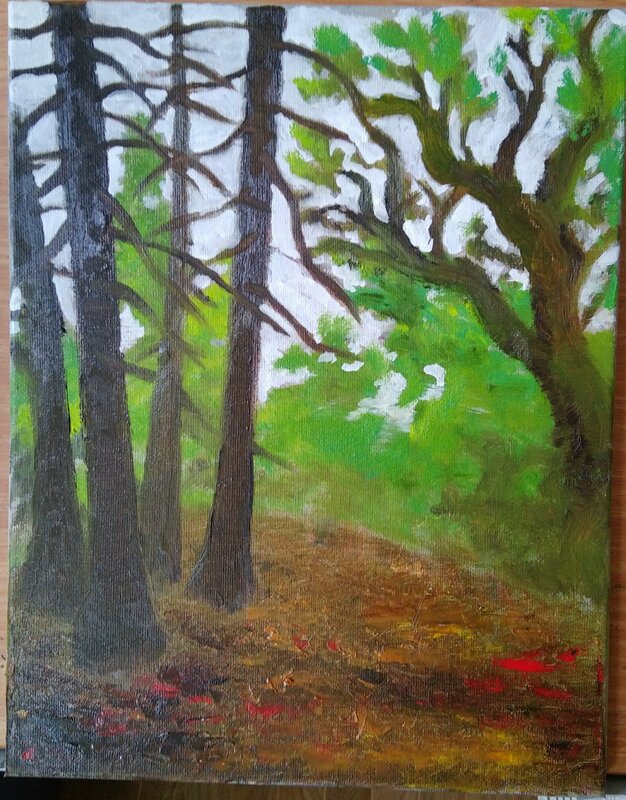 After much hiking, I emerge the victor and contentedly tow my painting out of Joaquin Miller park. Search to the ends of the Earth for your paintings. Hunt them and take their plunder for yourself. And a gold piece to he that catches the white whale! Many thanks to ye who enjoyed reading my exploits, more to come at SCLeccentric! This is a lovely painting. The workmanship of risk wins out! A fine painting, sir! But reflect that you never will catch the white whale, try though you must. He is without shadow, or depth. He has no perspective though he sometimes takes form like a ghost in the mist, still there is no sure way of seeing him clearly. No way of truly perceiving him except, perhaps, through the dark glass of obsession and madness. Never the less, paint on! He swims just beneath the oils!